Naala-Ba, curated by ISEA Indigenous Creative Producer Merindah Donnelly, was a brisk, enjoyable and thoughtful contribution to the ISEA2013 program, if providing little evidence of or information about the much wider Aboriginal and Torres Strait Islander engagement with electronic media. Martu (Western Desert, Pilbara region) artist, lawman and storyteller Yunkurra Billy Atkins collaborated with Perth-based media artist Sohan Ariel Hayes to create an engrossing animation that tells an alarming traditional tale of skeletal earth spirits, the Cannibals of the film’s title and how they savaged Atkins’ Dream Time ancestors living around Lake Disappointment (“white fella name my country”). Atkins’ unfolding landscape is bordered with slithering snakes is realised in solid colours heightened with dots. When the black-skulled Cannibals emerge, they rush towards us, appearing to break through the thickly painted two-dimensional plane, but without spoiling the integrity of the artist’s inheritance and adaptation of traditional painting. You can see a very brief example of this on Vimeo. The birth of a greedy baby Cannibal, quite human in appearance, signals disaster for the pale-skinned, big-jawed Martu. The Cannibals attack, striking off heads and limbs and emptying bodies into the salt lake into which the Martu, bound to be eaten, slowly sink amid mud and bones. As for the Cannibals, “They alive, not dead…,” says the storyteller at the solemn end of this skilfully animated, lively and visually accomplished seven-minute film. At the end of long dark curtained passageway, projected at almost human scale on a vertical screen, is the image of a young woman, head down, standing amid small candles. She looks up at us with a direct gaze, almost defiant, her body moving in a minimal, gestural dance over which a super-imposed self slowly appears, ghost-like, hands hovering over a face marked in white as if for a ceremony. As in many Aboriginal works, contemporary or traditional, the sense of an ever-present spiritual dimension is near palpable. The maker and performer of Shifter is Melbourne-based Wiradjuri artist Naretha Williams—described in the program note as “creat[ing] work that explores, questions, provokes and dismantles ideas around identity, culture, esoteric knowledge and contemporary shamanics.” She has a very evident interest in co-existing selves, “shifting and morphing, yet holding the same space”—hence the title of this 3.50-minute video loop. With the title Terraist, Brisbane-based, Waaynyi (Southern Gulf of Carpentaria) artist Gordon Hookey converts “Terra Nullius” into a provocative act of reclamation, at the same time reappropriating the kangaroo as a symbol from White Australia in his funny but pointedly political animated film. Line drawn animation briskly sketches a tent city over which Canberra’s Parliament House forms and people mass about the tents. 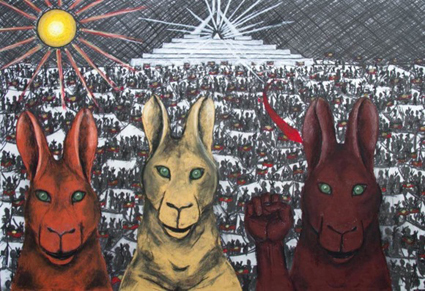 They are revealed to be kangaroos (Hookey’s favoured image of resistance), three of them forming before us in close up, defiant, fists raised, their fur filling with colour (ochre-ish red, yellow, brown). Acquiring sunglasses they appear stylishly authoritative as well as tough, their eyes taking on the hues and shape of the Aboriginal flag. It’s as if their very being, a source of great energy and luminescence, is enough to change the world in a mere 1:53 minutes. You can watch Terraist here and then let Gordon Hookey take you on a guided tour of the work here. Naala-Ba, a program note tells us, means ‘look to the future’ in the technically extinct Dharug language, although specific words have been collected and adapted (http://www.dharug.dalang.com.au). The exhibition displays works that are potent in their own right, if not exemplary of the range of strengths of Indigenous artists’ engagement with electronic media. In an ISEA program that looked back to electronic art’s past as well as celebrating its present, it’s a great pity that digital works by Rea, Karen Casey, Warwick Thornton (as with his 3D installation, Stranded in 2011 and Mother Courage at ACMI this year http://www.realtimearts.net/article/issue113/10963) and others were not exhibited. Instead two animations and a video work comprised Naala-Ba and Christian Thompson, with a haunting sound work (the winning entry for me), was a finalist in the video-dominated Anne Landa Award for video and new media arts exhibition at AGNSW.